Illusive Fairy: Bianco Antico Granite. She has the surprise loving personality in the kitchen remodeling process. From the far image, Bianco Antico Granite Countertop seems only gray and white mixture of the colors. The close look gives the details. Grays turn into Browns, burgundies and metallic coppers. The non-homogeneous patches on the stone are big and visible which make Bianco Antico granite very unique. The refraction of the light is almost same even under natural light or excess kitchen lighting. When the granite quarry first opens the specs inside the granite have some certain colors. As the quarry goes deeper, the colors tend to change. Bianco Antico is a good example for this drastic change. Some stone has more dark spots like having a tan skin under the sun. The Brazilian Fairy, Bianco Antico is a choice for your kitchen remodeling that will not disappoint. Her other sisters are White Ice Granite, Bianco Romano Granite, Delicatus White Granite and White Spring Granite, Alaskan White Granite and Delirium White Granite. She does not clash with most cabinet colors. As a new trend in kitchen remodeling , she is very popular with two tone cabinets. Still, your backsplash selection will be the best with natural tones. Now, it is time to share the inspired pictures of Bianco Antico Granite Countertop. Picture Credit:Echelon Custom Homes via Houzz.,Romance in the air! With Bianco Antico Granite overhang island top and perimeter countertop, strongly I can feel the Mediterranean love. 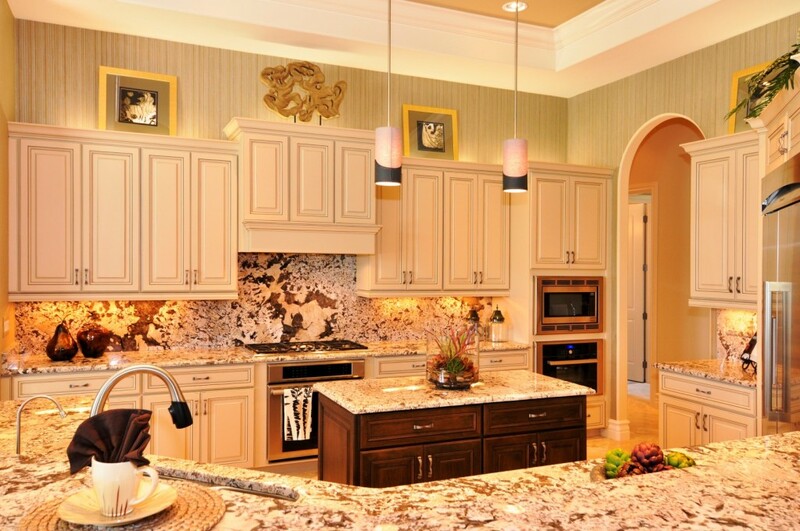 Two tone cabinets kitchen embellished with curvy corner china cabinet. The harmony of dark wood flooring and ceiling planks is very rich and bold. Two thumbs up kitchen design. Picture Credit: Harbourside Custom Homes via Houzz., Illusive Fairy , Bianco Antico Granite is used as a full high backsplash, perimeter countertop and island top. The off white cabinets and walnut island base are just right to show the beauty of the stone. Unique looking kitchen designed with keen eyes. Picture Credit: Susan Hoffman Interior Designs., Beautiful dreamy two tone cabinets kitchen with thrilling Bianco Antico Granite Countertop and Overhang Bianco Antico Granite Island Top. Walnut flooring with walnut stain , antique stained chairs, Benjamin Moore China White Perimeter Cabinets, and antiques fireback; handmade subway tiles for the rest, cream sitting on a row of taupe as a base glass backsplash. Hats off design. Picture Credit:Couture Designs., Soft and sophisticated. Bianco Antico Granite Countertop and and Island Top go very well with white cabinets and textured natural slate backsplash. The island base , kitchen stools and flooring help to pop up the Bianco Antico Granite. Kitchen pendants are entirely elegant. Adored well done job. Picture Credit:Creative Spaciz / SPACIZ Design Studio I., Bianco Antico Granite Countertop and Overhang Island Top in Contemporary Kitchen. Porcelain flooring and glass mosaic backsplash and stainless steel appliances and stainless steel vent hood are the complimentary elements. I think Bianco Antico Granite goes very well with espresso stain cabinets and the cross reeded glass cabinet door is a big novelty in kitchen remodeling. The reflection of the tree branches on the granite is amazing. Mother nature treats that kitchen very well. Skylight window ( ceiling window) in the kitchen is a big bonus. Please feel free to drop a comment to make this article less illusive.